WET OR DRY THRILL SLIDE! The best water slide on the market just keeps getting better. You can have the comfort of knowing your guests will be riding all day long on one of the safest waterslides. 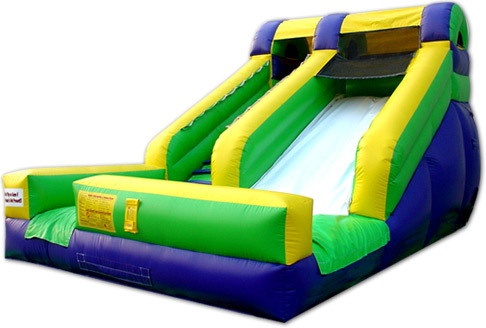 The slide includes a netted no jump area at the top to force participants to slide down the slide in the proper manner. It is the perfect size to fit most yards and the perfect price to fit your budget! This water slide is sure to be the biggest hit of any party. For our customers that are looking for a dry slide to keep the kids entertained without the water, this slide can be used dry as well.